A reflective, humorous and useful roundup on the latest must have products for bathing baby that make life just that little bit easier! Slippery when wet? Oh yes! I remember that well and to be honest I was shocked! I don't know quite what I was expecting but I really wasn't expecting a slippery eel! Sorry for the vivid description but really it's true! Also why did I think that kneeling on the floor and leaning over the bath was a good idea? Everything was sore, the bath was HUGE and the baby tiny. Why not have a small bath which could be popped on a table top, in the kitchen, less water and with the radio on in the background - now this is sounding much less stressful. Get everything set up before you start - everything to hand starting with the changing mat next to the bath so that you can undress baby quickly and efficiently and everything that you will then need to redress baby after the bath. A gadget that tells you the temperature of the water is both useful and reassuring. Hooded Towel??? Get 2! They are essential! An ordinary towel is just no good. 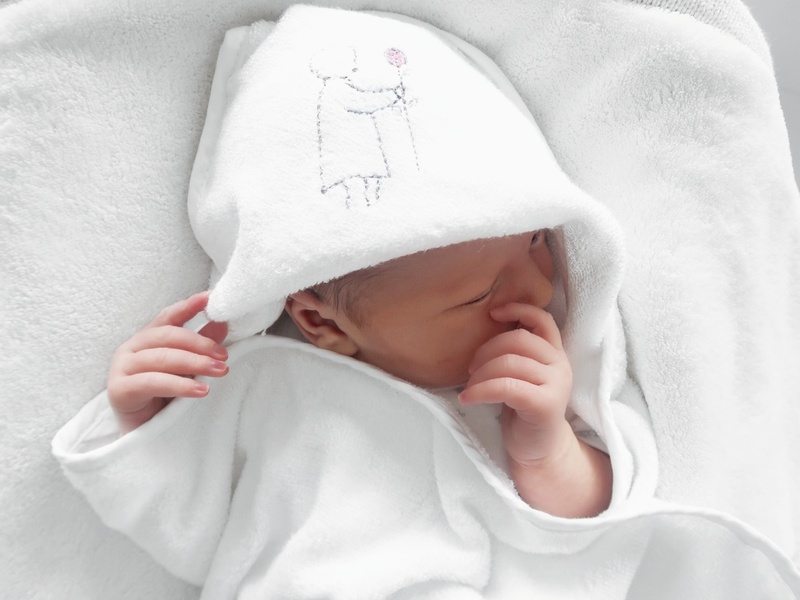 Babies get cold and quickly and if you have a hooded towel you can wrap them up like a parcel with their heads covered safe in the knowledge that they feel warm and secure in your arms whilst you have a lovely cuddle and congratulate yourself that you are doing well! Notice what is playing on the radio! It's the tracks of those early weeks and months - they are an important soundtrack to your life. Take a moment. Baby Massage??? Yes, yes, YES!!! This is essential! Go and find a class. There are plenty around ask your Health Visitor. Its a lovely thing to learn how to do and something that you will enjoy with your baby as they grow. You spend ages making this Bathtime moment perfect, you are busy cuddling your freshly wrapped clean towel parcel whilst listening to the tracks of those weeks when all of a sudden a wail emerges from your perfect warm parcel! Oh no! What now? Nearly always it's either wind or they are really bored of you enjoying your moment and they want action and they want it now! Cue baby massage! They have your attention, they gaze into your eyes, your heart goes to mush and you are massaging those dimples and folds and tummy that is learning how to work properly and by doing so you are helping to send scented air bubbles out to join the tracks of those precious weeks. A shocked face, a smile, a giggle that will make your heart swell with pride. We are so forgiving of our babies scented air bubbles, in fact we really relish every single one - funny that! Products??? It really does matter what you pop on your babies skin. Choose organic, natural, free from nasties. Choose products that focus on quality and care,from companies that place every effort to ensure the highest quality ingredients and overall performance of their products. FREE FROM parabens, SLS/SLES, phthalates, dyes, mineral oils or fragrance allergens…. because what we put on our skin matters. It's a harsh world out there. Be prepared and look after every inch of your amazing creation. Everything you need for a stress free Bathtime can be ordered from Daisy Tree Baby Boutique and posted out UK wide. Make it easy! Check out the Bathtime Tab on the website!